If you’re about to embark on a quest to find a sorted electro-acoustic, this epic new SE model is a great place to start. Playability, tone, build quality, pickup performance - this thing just keeps on ticking boxes. Then there’s all that sweet ziricote. It’s tough to be mean when you’re presented with a package that’s put together so well. The fact is, stamping any kind of brand identity into a new acoustic guitar isn’t easy. Most of the gear out there conforms to tried-and-trusted body formats, not least the iconic ‘dreadnought’. If you haven’t sussed it out already, that’s where the new PRS SE A60E model has a distinct advantage over the legions of doppelgängers. It is, well, distinctive. By incorporating some well-kenned eye-candy from its electric solidbody stuff, it’s immediately obvious that this is a PRS guitar. The sweeping headstock shape is Exhibit A. The beautifully installed ‘bird’ fingerboard inlays are the smoking gun. This new Chinese-made model is a member of PRS’s affordable SE sub-brand. The Natural finish A60E is built around the company’s pretty Angelus Cutaway profile. 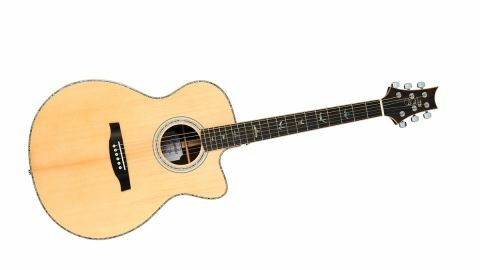 Further features include solid Sitka spruce top, three-piece 643mm (25.3-inch) scale mahogany neck, 300mm (11.8-inch) radius ebony fingerboards with 20 medium-sized frets, plus ebony bridge plate and bone top nuts and saddle. There’s also some nice abalone soundhole rosette detailing and shiny chrome tuners on the spec sheets. You get a proper deluxe hard case, too. Dig deeper and you find this character also comes brandishing a Fishman GT-1 preamp and under-saddle pickup. Yes, you’re looking at a well-sorted electro-acoustic here. The A60E finds its solid Sitka-spruce top partnered with sheets of finest ziricote. Obviously, at this price we’re talking laminates, not solid wood. But, er, stop the bus for a second. Ziricote? Now, we don’t imagine for a second that you’ll care that this timber’s scientific name is Cordia Dodecandra. You might even shrug when confronted with the fact this stuff is grown in Mexico and South America. What should grab your attention is what this wood looks and sounds like. Ziricote is a denser and more highly figured alternative to the CITES-protected Brazilian rosewood. The A60E plays host to PRS’s much-loved and fingered Wide Fat neck profile. At just under 43mm at the nut, this shape isn’t actually all that wide and it’s not quite as chubby as the name suggests, either. Judging by the satisfying amount of beef slapped into our palm we’ll chalk this shape up to a full C. A low action and sensibly spec’d 0.012 to 0.053 gauge strings help achieve a maximum score for the playability in both SEs. Being a newborn, this guitar will take a bit of encouragement before it reaches tonal adolescence. That said, the use of X/Classical hybrid top bracing hasn’t half given it a great start in life. This setup offers the string tension resisting strength of traditional X-bracing, the format you’d find on, say, a dreadnought, with the flexibility of a classical guitar top. The more that top vibrates, the greater the tonal sweetness and output. The A60E doesn’t quite have the same bottom-end depth of its recently-reviewed SE sibling the T50E, but you can’t help feeling it’s in the post. While the T50E comes across as the all-rounder, the A60E reveals itself as the fingerstylist’s apprentice. Arpeggiated chords roll out sweetly and we love the consistency of output during jazzy breaks. Each note pings off the fretboard like a hyperactive flea. It’s exactly what we expected. The rosewood-like vibe of the ziricote is warm and rounded; the figured maple gives the other guitar its clearly defined zing. Plugging in evens the playing field a bit. The Fishman GT-1 preamp lurks inside a guitar’s soundhole - poke around with a finger and you’ll encounter its volume and tone controls. As you would expect, the Fishman system cuts the old mustard. There’s a lot of tonal variety here and while you miss the 3D dynamics of a mic and pickup combo, you get pretty damn close to each SE’s acoustic voice when you plug in. The obvious target of the PRS marketing for the A60E is the existing SE punter. You’ve gotta love that you can get the same neck profile on your solidbody and electro-acoustic guitars. That goes for lovers of US-made PRS gear, too. This model offers a high-enough spec and build quality to make it attractive to you well-heeled customers. It’s tough to grumble about these things. This guitar plays and sounds as good as you could ever expect for less than a grand. Way better, in fact. It looks the absolute business as well, especially the A50E’s breathtaking ziricote bits. If you’re about to embark on a quest to find a sorted electro-acoustic, this epic new SE model is a great place to start.